Home Weapons Is Wavesplitter The Best Exotic Trace Rifle? Recently there has been some controversy surrounding this weapon. Last week Wavesplitter was made available to PC and Xbox One Guardians by mistake, so now any of them who acquired it have a broken version until it’s unlocked in September 2019. Currently Wavesplitter is a Playstation 4 exclusive weapon, but the comparison will still be valid once it’s open for all Guardians later this year. The stats on Wavesplitter are as follows. The hidden stats on Wavesplitter are as follows. These stats might not look impressive in the right places, but they’re completely attuned to what a Trace Rifle needs. A higher Impact causes more Recoil and less Stability, but what a Trace Rifle needs is a lower Impact that allows the Guardians using it to keep the beam focussed on the enemy. With the rate at which ammo depletes it could use a larger magazine, but you’ve got more than enough to nail a Guardian in one clip if you can keep them in your sights. The only thing I’d say could do with a boost is the Zoom, given the beam’s colossal Range. Perks are tricky to keep track of because they can be randomised, and Bungie like to change them every now and then for balancing purposes. what we’ve done here is cover the perks as listed on Wavesplitter on Destiny 2 DB, which is generally pretty accurate for these things. 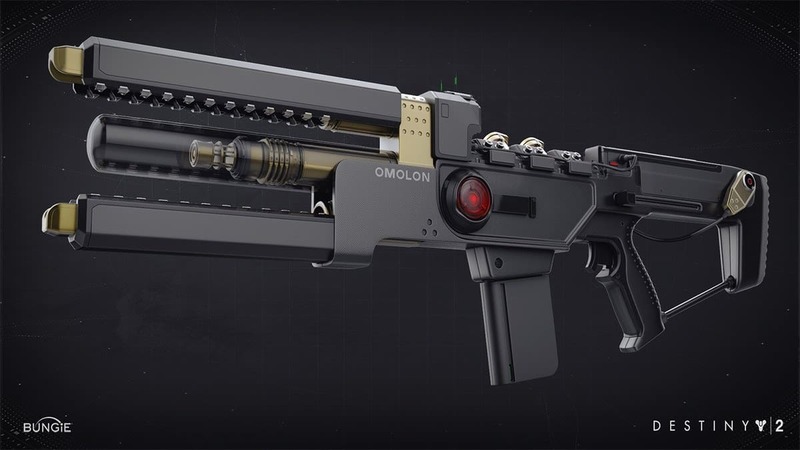 Exotic Perk: Harmonic Laser – This laster has three power levels which will oscillate while the trigger is held down. Polygonal Rifling – the barrel of Wavesplitter is optimised for reducing recoil, meaning it boosts Stability. Enhanced Battery – Wavesplitter has a strong battery life, increasing Magazine Size. Supercharged Battery – When you pick up an Orb of Light you’ll do an automatic reload and then receive a burst of maximum power to Wavesplitter for a short time. Fitted Stock – This stock is stable but heavy, increasing Stability and moderately controlling Recoil while also decreasing Handling Speed slightly. Standard tracker perks for no tracking, PVE kills, and PVP kills. All of these perks are great for enhancing what is already an incredible base weapon in Wavesplitter. I think it’s obvious how much they benefit the user when you consider how many times you’ve been killed by a Guardian using this in the Crucible, or in Gambit. But is Wavesplitter better than Coldheart and Prometheus Lens? Prometheus Lens definitely has worse stats than Wavesplitter, but its Exotic Perk adds an increasing damage aura to enemies, which increases in power the longer the beam is on them. You could argue that this is comparable to Wavesplitter’s oscillating power levels, but there’s no direct comparison to be had. Coldheart’s stats look even more unimpressive than those of Prometheus Lens in comparison to Wavesplitter. The Exotic Perk doesn’t add much to it, other than possibly slowing enemies down, but it too has a damage aura effect that increases the longer the beam is on the enemy. With both Coldheart and Prometheus Lens using what is essentially the same Exotic Perk I think we can lump them into one Trace Rifle for comparison. The damage aura is powerful on these weapons, but I’ve never seen something so accurate as Wavesplitter. Combined with the massive ammo reserve it has, I can’t see any argument for saying Wavesplitter isn’t the best Exotic Trace Rifle in Destiny 2. So there we have it. For any PC and Xbox One Guardians I’m sorry but you can’t use the best Trace Rifle in the game until later this year, meaning Playstation 4 Guardians have an almost unfair advantage. What I will say is that while Wavesplitter is the best Exotic Trace Rifle, it’s far from the best weapon in Destiny 2.